Marvel’s Captain America: The Winter Soldier is the second chapter in the thrilling Captain America movie franchise. The exhilarating story follows Marvel’s First Avenger, Captain America, along with Black Widow and their new ally The Falcon as they battle their most mysterious and powerful enemy yet, the Winter Soldier. What went through your mind when you read the script for Marvel’s Captain America: The Winter Soldier? When I read the script, it didn’t feel like a superhero movie; it felt like a very grounded political thriller with a 70’s espionage vibe. It still had the action sequences, the dialogue and the tone of a superhero movie – but I talked to [the movie’s directors] Joe and Anthony Russo and they had such a good vision for it. The direction where they wanted to push the film is a bit of a deviation from the Marvel formula in terms of tone. I was all for it. Anything that Marvel wants to do, they’re going to do well. How does the story of the sequel compare to Captain America: The First Avenger? There’s so much information that you have to cram into origin films that you can’t dive into the character struggle. Captain America’s biggest struggle in the first movie was not being able to physically achieve what he wanted to achieve. In The Avengers, we had so many characters coming to the table that we couldn’t spend too much time with anyone. In this movie, you get to see a little bit more of an internal battle with Captain America. He’s such a selfless guy, so it’s hard to see him find conflict because he will just take it on his back. It’s nice to see him at odds. What else is new in the sequel? Robert Redford! Marvel does an amazing job of finding great people to fit certain roles, and we’ve got a lot of great new people in this movie. Between Robert Redford, Anthony Mackie and Emily VanCamp, there are a lot of great people on board. What’s it like to work alongside Robert Redford? Robert Redford is amazing. It was pretty intimidating at first because he is a living legend. However, it’s always a treat when someone you look up to lives up to the expectation. He could have very easily come on set and hijacked the film; not just as an actor, but as a director with all his experience. He could have easily taken over. Instead, he showed up with the utmost professionalism. On the first day we filmed, we shot until 1am and he stuck around for my off-camera scenes. He really is an example of what it is to be great. What did you enjoy the most about working with the movie’s directors, Joe and Anthony Russo? Anthony and Joe are great. They are very normal people. You talk to them and you feel very comfortable; there is not much you can’t say to them. They are wildly articulate with their vision, and they know what they want. They have conviction. The most comforting thing an actor can feel from a director is that they know what they want. They have answers to questions. These guys know film. They know what’s good and what’s bad. You trust their internal barometer. As an actor, it’s a very comforting thing. How did it feel to wear the Captain America costume again? I thought it was supposed to get more comfortable, but it always feels like it gets tighter. It’s got worse. I’m not joking! To be honest, they always make improvements on the costume in every movie and it is the type of thing that loosens up once you get a good sweat going. It’s great. Is it exciting to wear the costume again? Sure. It’s very exciting to wear it again, but a lot of it has to do with the fact that you know you’re making good movies. If you were disappointed with the previous film, it would be hard to mentally prepare yourself for living in that costume for four or five months. But since Marvel can’t stop making quality movies, it’s exciting and it’s humbling and it’s an honor to jump back into the costume – no matter how uncomfortable it is. How long does it take to get into the costume? Getting into the suit is not a one-man job. You need someone else to help you, but you can probably get into it in around five to seven minutes. It starts to get tricky if you have to go to the bathroom because it’s not built that way. If you have to go, the whole thing might have to come off! Captain America’s friendship with Sam Wilson – aka The Falcon – blossoms in this new movie. How would you describe the relationship between these two characters? Captain America is still a man out of time. Even though he’s become acclimated to this modern era, he’s still relatively alone. In a way, Steve Rogers is a celebrity. He wears a mask when he fights, but everybody knows what he looks like. He’s been frozen for seventy years and there’s a feeling of alienation that can come from that, but Sam Wilson treats him like a regular man. Instead of trying to talk to him as Captain America, the superhero, he talks to him as a soldier. There’s a bond that is formed very quickly and it’s certainly something that Steve Rogers needs at this point in his life. How would you describe Captain America’s relationship with Black Widow in the movie? Steve Rogers and Black Widow are very different people. Black Widow has made a life out of deceit and being a spy, but Steve Rogers’ life is saturated in value and honesty; he couldn’t lie if he wanted to. They are an interesting pairing and an odd couple, but they have to trust one another in this movie in a way that they’ve never trusted each other before. They don’t exactly approach things the same way, but they are forced to work together and they end up learning quite a lot from each other, too. 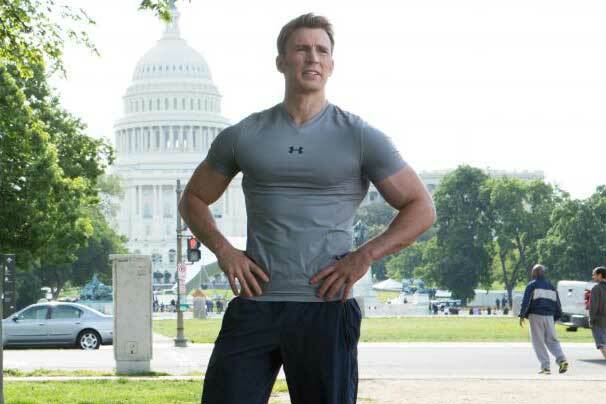 What physical training did you tackle in order to prepare for the highly physical role of Captain America in the sequel? We tried to step up Captain America’s fighting ability in this movie. Part of that involved making him move in a more acrobatic, fluid style, so we did about a month of gymnastics classes to prepare for the fight choreography – and it was so much fun. There was a lot of rolling and tumbling and flipping and spinning. There was a lot of trying to keep things fluid and coordinated, and not stepping on your own feet. I was like a little kid! What can you tell us about the action scenes of the movie? There are a lot more fight scenes in this movie. It’s a whole new level of combat, so there was a lot more training and a lot more choreography. In order to make those scenes look right, you have to know the choreography inside and out. You are contracted to play Captain America in six Marvel movies. Was it tough to commit to the character for such a long period of time? It’s a tricky situation because it was 2010 when we started this, but we won’t finish until maybe 2017 or 2018. Who knows when this is going to be all said and done? That’s a big chunk of time, so it was very daunting. It was a big commitment and a lifestyle change, too. You’ve mentioned in the past that you were initially hesitant to sign up for the role because you didn’t want to be typecast and you were worried about losing your anonymity. How do you feel about it now? Had I not done these movies it would have been the biggest mistake of my life. It really would have been my biggest regret, and there are plenty. It’s changed everything for me. It’s enabled me to do things outside of these movies, but it’s also comforting to know that you’re making good movies. It would be a nightmare to be trapped in this contract if you were making films that you weren’t proud of – but Marvel has the Midas touch. Every time I suit up, I know that I’m making something of quality, and it’s rewarding on every level. Thankfully, I had the right people in my life pushing me to make the right decision. I couldn’t be happier.